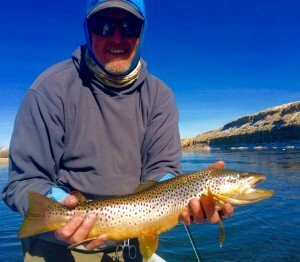 Bighorn River Fishing Conditions Wyoming: Good news! The warm weather this week helped to defrost the river. The ice dam between Wedding of the Waters and Hot Springs State Park is now gone! 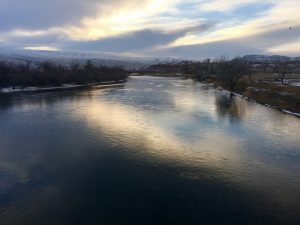 There is little to no ice floating down the river and conditions are in good shape for winter fly fishing. This weekend is the last to hunt waterfowl. We had a great weekend this last week with good luck with both the cast and the blast. There was never a dull moment in the boat. Hot flies right now are worms, midges, sowbugs, and streamers. 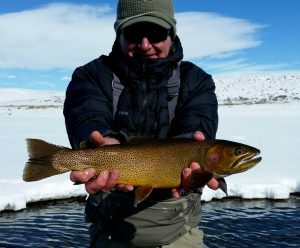 Our guides love fishing in all conditions and seasons, but winter is a whole different special. Not much traffic on the river, nice backdrop, and stellar fly fishing. 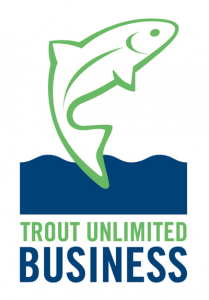 We are still offering our winter special for $350 (one angler or two). 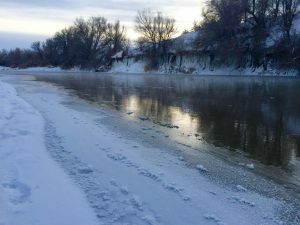 Bighorn River Wyoming Fishing Report: Temperatures have been cold and we have been receiving some snow. It looks like warm weather is on the way in the next few days. The river is floatable and fishable, especially on a little warmer day. 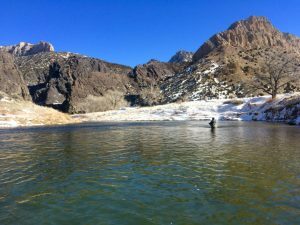 Should the river become iced up on the Bighorn, Dunoir Fishing Adventures is one of three guide services that are permitted to float the Wind River below Boysen Dam. 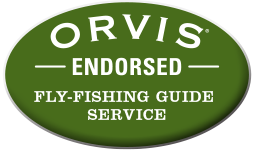 There is always someplace for our guides to float and fish. Hot flies include: sow bugs, annelids, and midges. Streamers have been pretty decent too. We have guided trips coming up and boats going out in a few days. 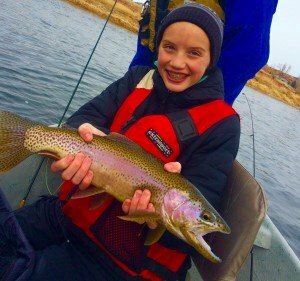 Keep posted for more fishing reports from the Bighorn River in Thermopolis, Wyoming. The river is definitely not crowded right now, and it is great to shake the cabin fever! 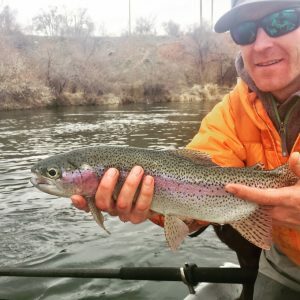 Bighorn River Wyoming Fishing Report: Fishing on the Bighorn River is back to “Bighorn Good.” We had a great day with our friend Chad on Sunday. It looks like spring time is in the air with great fishing and more boats on the river. It was nice to see all of the couples floating and fishing together on Valentine’s Day. 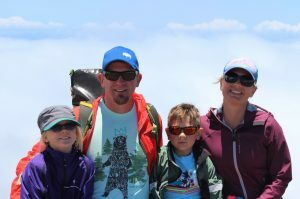 A family that plays together, stays together! The rainbow trout are starting to spawn and stage on their redds (spawning beds). 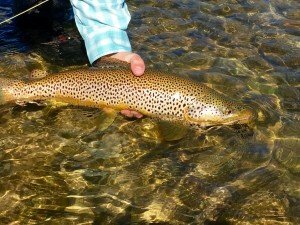 Dunoir Fishing Adventures asks anglers coming to fish the Bighorn River to please not fish, wade, or walk across the redds found in shallow riffles in the white gravel patches. 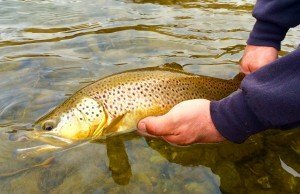 There are plenty of nice fish to be caught in the deep runs beneath the riffles without disturbing spawning fish. 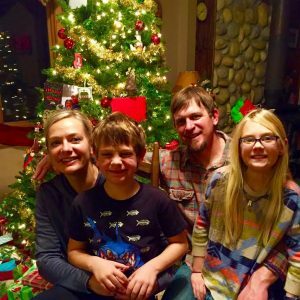 They are the future of keeping the Bighorn the fishery strong and healthy.